It’s Sunday and it seemed perfect to have our first John Thornton graphic. Richard Armitage and the entire cast of North & South made this production worthy of repeated viewings. Speaking of which, there is going to be a worldwide group watch of North & South next month and I hope you can participate! I sure am. This project has been initiated by Fanny/iz4blue and details can be found here: N&S Group Watch. Today’s image and song recommendations come to us courtesy of Luciana. Thank you so much for your contributions, Luciana! *sigh* John Thornton is such a romantic character. Have you read the book yet? It goes into a lot of detail about his passions. ♥ The song chosen by Luciana was definitely appropriate: Too Marvelous for Words. I extended Thornton’s back in the original image and overlapped the two figures. Then I applied some adjustments to brighten and soften the faces. Next I added a wild rose after cutting it out. This entry was posted in Collaborative Project, Graphics, richard armitage and tagged actor, diana krall, graphic a day in may, graphics, group watch, john thornton, north & south, richard armitage, richardarmitagenet, richardarmitagenet.com, richardarmitagenetdotcom, too marvelous for words. Bookmark the permalink. Lovely graphic, Bccmee. You’ve caught his intensity beautifully. Well pin a rose on your nose! LOL – lovely one again! Sorry, just realized the picture was selected by Luciana! And the group viewing project is Fanny’s. Oops! @Luciana: N&S is a great read, isn’t it? I just love that book! ♥ I’m so delighted you enjoyed your graphic. Over here, Mr. Thornton! Your wild rose awaits you! I am the one that loved you from the moment I saw you with that cotton snow falling all around, and even after you punched that guy out, I, unlike Margaret Hale, never judged you. If Margaret didn’t already know that Thornton loved her, his going to Helstone certainly confirmed it (sigh)… And you’re right, “You have to look hard” does have many meanings. Great picture choice, Luciana. Nicely done, bcc! Very lovely! Thanks for letting me know about the group watch! This is one of the N&S photos I like most and you Bcc, became it more stunning yet. I liked the way as you put in the same picture two distinct looks from Thorthon.He is so penetrated in his thoughts in both of photos. Excellent performance of Richard in this scene . Thank you Luciana for chosing this picture. Hugs for all and have a GReAt Sunday!! very pretty! every day is such a pleasant surprise. Sooo gorgeous.Almost smell the rose’s perfume! Yet another excellent choice. Thank you for all the effort and hard work. 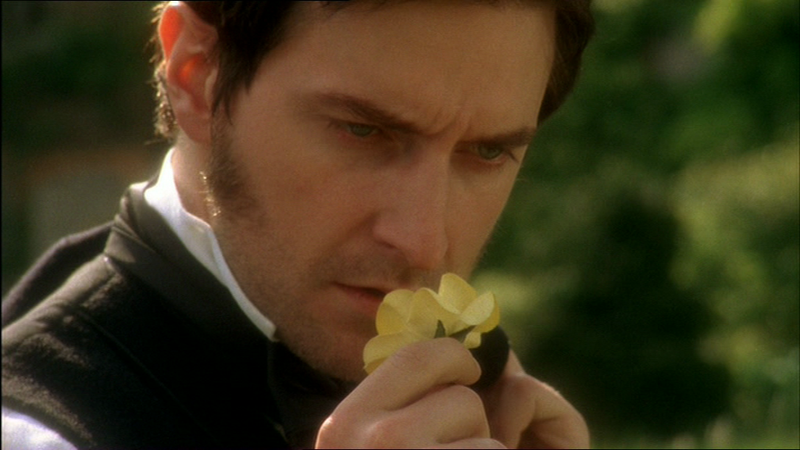 Oh, Mr. Thornton * thud * beautiful picture choice, Luciana! John Thornton is looking so hard here he’d give an electron microscope a run for its money. Wow! My adorable Mr.Thornton, the one and only 🙂 What a way to finish a Sunday! Thank you Bcc and Luciana. Lovely graphic, bccmee!! I like how you overlapped the images. 🙂 Great choice of cap, Luciana! May I also use the siggie you have done for the 1st day of this challenge ? And the one of Day 7th ??? @Everyone: Aw, thanks for your lovely sentiments! This really is an intense expression on John Thornton’s face. What is he thinking? 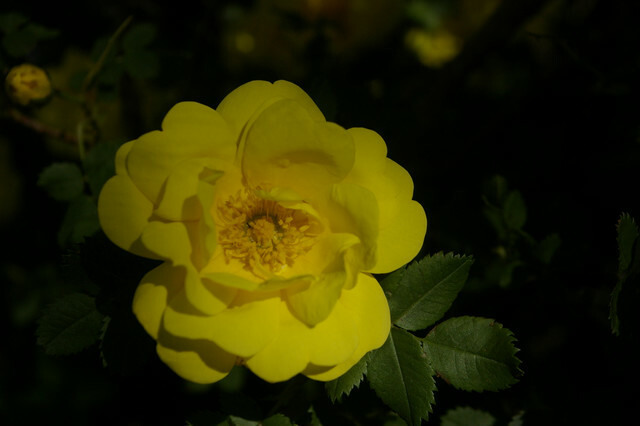 The roses are very symbolic in the book and movie. Now if only we could get our hands on the missing scenes and re-edit the film, LOL!